By the later part of 2003 a group of young computing professionals came together with one purpose and that is to create a software development company. This company would grow at a trem endous pace and eventually have a major impact on the cellular mobile phone as we know it. It soon became very clear that the product which they developed would become the dominant OS in the already very competitive field of mobile computing. Therefore a decade later this robust OS was installed on almost 270,000,000 smartphones which is far more than the output of any of their competitors such as iPhone. The sales of android devices for the year 2014 alone was expected to exceed 1 billion. In the latter part of 2014 almost 85% of the market share already belonged to android as far as the global smartphone industry was concerned which was significantly larger than the market shares of BlackBerry, Windows phone and also iPhone. It’s not only in the smartphone sector that android was dominant but they also dominated as far as tablet computers was concerned and of the almost 200,000,000 tablets sold 62% was loaded with android during 2013. Android was an initiative by Google which was focused specifically on mobile devices. There were several other smartphone operating systems before android appeared on the scene and one of those was iOS. However despite the early start of iOS it is clear when one looks at the statistics how tremendously the popularity of android has grown since its inception. Anyone with a little knowledge about the smartphone industry will know that android OS was not originally designed for use on smartphones. In fact the inventors of this OS had other plans which was actually focused on smart cameras and not so much on smartphones. When one look at the operating systems for other popular smartphone platforms it will quickly be seen that the android OS has gone through a tremendous amount of updates. This evolutionary process is very much like a web-based system which is showing very little similarity to the original version of the first android OS. Four technology experts joined forces in 2003 and this led to the establishment of android incorporation which was located in Palo Alto, CA. This four men, Chris White, Andy Rubin, Nick Sears and Rich Miner joined forces with one purpose and that is to create an operating system which could be used on mobile devices. Such an operating system should be aware of the user’s personal preferences and also their location. When they initially started with android OS they were focused more on digital cameras and the idea was to create cameras which was able to access computer services. However just like any other sensible startup they soon realized that such computer cameras will not be high on the list of consumer needs. As soon as this was realized the android project started to focus on smartphones. Google purchased android very quietly in 2005 and although the purchase amount is undisclosed it was estimated to be in the region of $50 million. Many people in these early days expected that Google may eventually dominate the mobile market through the use of android but there were also other people who fully understood that the main purpose of Google was to increase their share in web-based services especially those used on mobile platforms. One of the most important dates in the development of android was November 5, 2007 when Google unveiled the open handset alliance. This was merely a consortium of technology manufacturers who agreed to participate in a venture that would create open mobile device standards. This initiative had immediate success because no less than 44 companies became partners in the consortium. At this early stage it became clear that android would be completely different from the iPhone system and primarily because it will not be limited to only one phone which has been manufactured by one company. This has important implications because the first android device would only make its appearance much later. In fact the HTC dream, the first android smartphone only arrive in 2008. As everyone with knowledge in the IT industry knows most operating systems which is loaded on computing devices are subject to regular updates which is supposed to fix technical glitches or to provide some improvement in the services which is provided to the consumer. Android has received more updates than any other OS and since it has first appeared on the HTC dream there were no less than 19 complete updates. 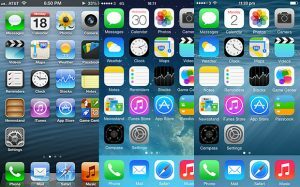 Compared to iOS which alone saw a major update approximately once a year, there were times when android was updated once, every two a half months. One of the very first android versions which was made available was known as 1.0 G1. This early version of android had a GPS and also multitasking functions and also Bluetooth services. In those early days there were only 35 applications available to users on android market but in approximately 13 years that has grown to over 1.4 million. In April 2009 the first update for the android system was made available. From this very first update a tradition was established were android updates was named after popular deserts. This decision has worked in the favor of android system updates since it insured more attention from consumers. This computer science article is provided by essay service – CustomWritings.com which prepares original academic papers for students.